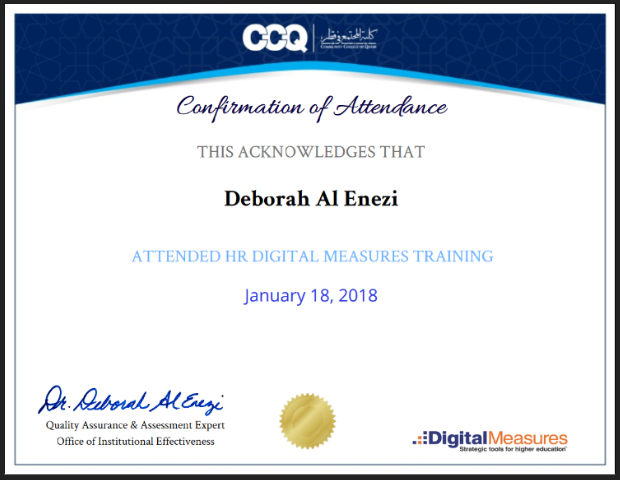 Congratulations to Dr. Deborah Al Enezi from the Community College of Qatar for being selected as the next SimpleCert Certificate of the month winner! The Community College of Qatar (CCQ) is the first community college in the country of Qatar. CCQ was established in 2010 in collaboration with Houston Community College, with a goal of bringing American-style junior college academic criteria and standards to the Gulf Monarchy. Dr. Al Enezi utilizes SimpleCert to distribute certificates to faculty and staff who attend various training and certification sessions throughout the institution. Dr. Al Enerzi has utilized SimpleCert to distribute certificates for New Faculty Orientations, Workforce Training Certifications, and even Human Resource and Adjunct Training Certifications. “With a faculty and staff that come from over thirty-five different countries, our use of SimpleCert certificates has shown that everyone – no matter where they are from – appreciates acknowledgment of their contributions,” says Dr. Al Enerzi. Dr. Al Enezi’s use of SimpleCert to distribute certificates for faculty and staff certifications is a unique use case, compared to other schools who utilize SimpleCert to distribute classroom and graduation certifications. SimpleCert, however, is a tool that allows for complete customization, for any certification use. Dr. Al Enerzi’s certificate design is suitable for framing, with a design and color scheme that reinforces the branding and graphic design of the community college logo. It is no small honor to see SimpleCert utilized in Colleges and Universities around the world, and we are thrilled to showcase the Community College of Qatar as a winner of the Certificate of the Month Program. By being selected as a certificate of the month winner, Dr. Al Enerzi will receive 250 SimpleCert credits in her account. Thank you Dr. Al Enezi for utilizing SimpleCert as your Certificate Management System, and for being a valued member of the SimpleCert community!